Hello lovely! Here at Paleo Harvest Kitchen, we like to keep it simple.. however, you can only eat sweet potatoes and salad so many days in a row before thegreeneyedgroom looses his mind. Paleo Side-Dishes are soo hard to come up with, why!? I’ll tell you why.. starches and sauces. Seriously, coming up with a good textured side-dish without using white potatoes or ranch, that thegreeneyedgroom will eat, is my biggest challenge, for sure. 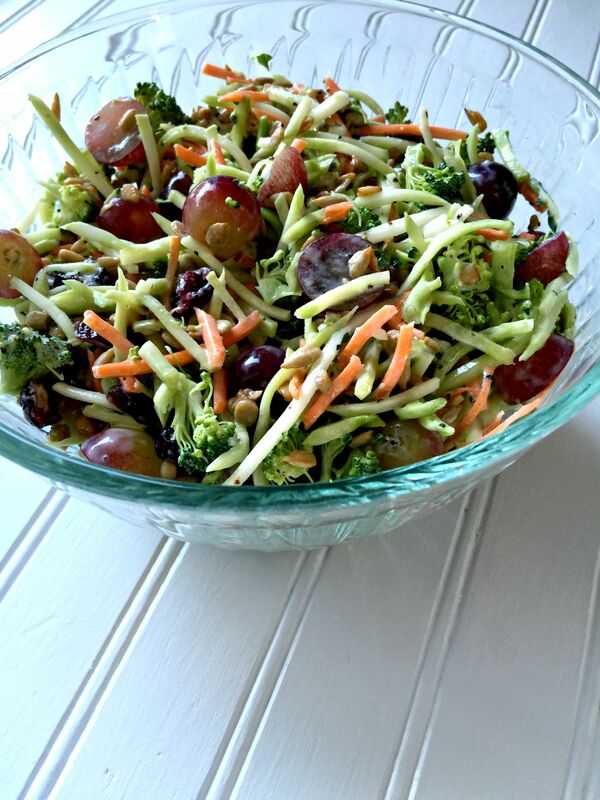 Today’s challenge: Broccoli Salad – we had to find a way to make the dressing without using mayo that is full of soybean and canola oil, without eggs, and without sugar.. It was a little difficult, can’t lie. Now that we have done the hard stuff, make it for dinner and let us know what you think!! 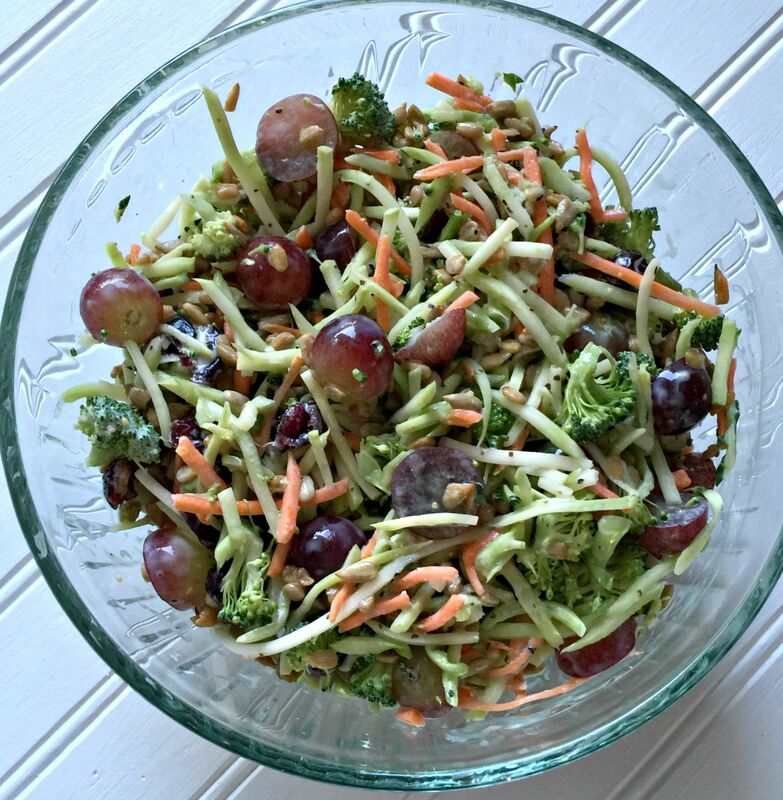 Start by finding a great broccoli slaw at your grocery store, we used the Organic one by Simple Truth at Fred Meyer. Then, chop half of a broccoli crown and add it to the slaw in a large bowl. Now is the fun part.. the little tasty bits. We used dried cranberries, halved grapes, and sunflower seeds. To mix the dressing, we used a simple measuring cup and stirred it. PHK Cooking Tip: If you don’t have grassfed yogurt, use a high-quality Greek Yogurt – that’s what we did! You could also substitute for some homemade Paleo Mayo if you are okay with eggs! Next time, we will add julienned apples and dried cherries. Yum! Then toss in dressing and served chilled. PHK Cooking Tip: Use what you have! If you have Chopped Almonds or Walnuts, use those? Like Strawberries more than Cranberries? ..all the power to you!! This would be a great side-dish for a bar-b-que or picnic, it is great with fish and chicken, and the acidity would be delicious with your favorite white wine! Check back in next Saturday when we take on another side-dish! Enjoy! 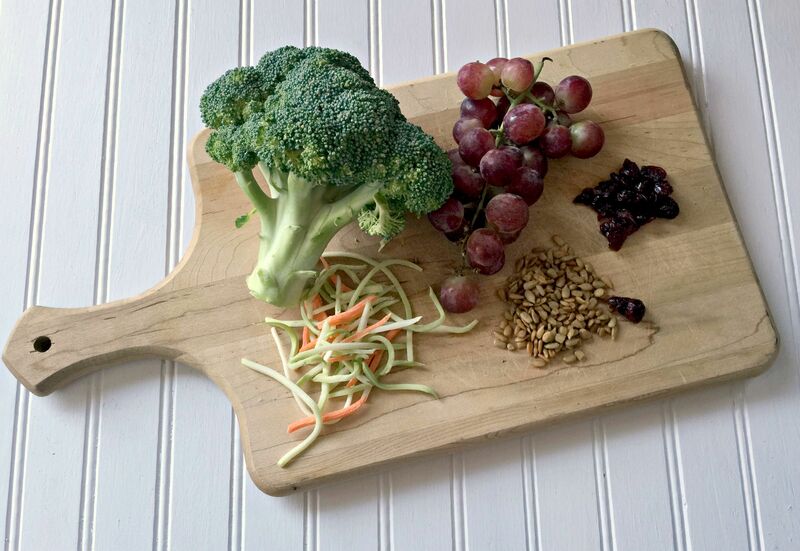 1.Place slaw and chopped broccoli in a large bowl.